Jacob, alone in an unfamiliar land dreams of a passage to heaven, and receives anew God’s promise to Abraham. Recognises God’s presence and worships. Bethel. *NCH002 / ZSS117 Glory Glory Hallelujah! Excellent African-American chorus; includes the verse “We are climbing Jacob’s ladder” and “every rung goes higher higher”. There is a version here similar to NCH. Good for kids. AoV2-154 / NCH606 / UMH528 / VU497 / A&M352 / HPP471 / CP538 / CP(E) 526 / Cha577 / Srce492 / MP482 Nearer my God to you / thee (Adams/Mason). I didn’t grow up with this song, so I find the tune kind of sappy and sentimental. Having said that, I really like the words in the NCH and it is an excellent fit for this reading “When I am wandering as Jacob did, and in the deepest night, the path is hid, my dreams will bring me, too, nearer my God, to you”. Please note that not all sources have such accessible words. Traditional lyrics. NCH500 / UMH418 / HPP454 / G(II)497 / GC693 We are climbing Jacob’s ladder. A traditional well-known favourite in some circles; NCH replaces “Soldiers of the cross” with “bearers of the cross”. Note that not all sources are as accessible. Traditional lyrics. Note there are also many recordings of this song (e.g. Pete Seeger, Sweet Honey in the Rock, Paul Robeson, Bruce Springsteen, Jane Siberry) that you may also want to use; it's interesting to see how each of these singers has altered the lyrics. Good for kids. Oldy-but-a-goody. *ATW 433 At the dawn of the ages / You were in this place (Mann) An Australian song about seeing God in this ancient land and in our indigenous people. “Do we take after Jacob, blind to what lies at hand, needing dreams to inform us God is here in this land?”. Tune is very smooth and simple. Lyrics. TiS 217 / AHB 148 / NCH43 / CH519 / UMH384 / VU333 / A&M721 / LBW315 / ELW631 / A&M721 / GA463 / HPP48 / GtG366 / PH376 / GC622 / GC(II)613 / G(3)641 / CP485/6 / CP(E) 516 / W&R358 / Cha517 / Srce457 / URW100 / 82Hml-657 / Lau801 / StF503 / MP449 Love divine all loves excelling (Wesley) A beautiful classic song and most hymnals use a very inclusive version of this hymn, even the AHB. Lyrics and sheet music. You may also like to give Rend Collective Experiment's version a listen (hard for congregations to sing, but nice for listening). Oldy-but-a-goody. Online Resource The sun went down on Jacob's grief (Idle) Good accessible words about this story. Lyrics and tune. *AoV2-070 / ATW 496 / MV090 / StJ / G(3)719 Don't be afraid (Bell) Excellent. I love this song of reassurance. "Don't be afraid, my love is stronger. My love is stronger than your fear". This song can be used as a response to intercessions. Good for kids. Sound sample. This song could be used as a Psalm response I think. FFS27 God of unexplored tomorrows (Jones) The tune will need to be taught, but is quite lovely (CROMWELL). Imagery of "God of rock and flowing river", "strong foundation" "cleansing, quenching water". NCH Psalter 86 O God you abound in steadfast love (Hunnicutt) A nice joyful refrain for this cantored or read Psalm. Music by Heart 68 Incline your ear (Allaway) This is quite lovely. It will need to be taught (instructions on how to do that are in the book), but is not difficult. It has 5 parts. Google books has a preview. *GtG844 Incline your ear O Lord to me (Morgan) Excellent words. The tune will need to be taught. *TiS 689 / ATE 286 / GtB Lord hear my praying, listen to me / Sorrowing song (Mann) Powerful words of prayer to a simple tune. Words are straightforward about asking difficult questions of God. Lyrics (loads a pdf). Being led by the Spirit and God’s adopted children. Tune In: Father of Earth, Mother of Sea. A latinesque song about the Spirit being with those who are victims, prisoners and the sick, as well as present in our prayers. Lyrics, sound sample, sheet music. Taizé / TiS 747 / ATE 214 / Iona (M&G) / GtG842 / PfAS027A / URW393 The Lord is my light, my light and salvation A simple and very popular Taize chant. Note that this is really easy on recorder if you have a kid in your congregation who is learning it. Good for kids. Youtube. TiS474 / AoV1-012 / ATE 295 / CH623 / SFFS 2236 / HPP553 / A&M363 / GtG401 / G(II)539 / GC839 / GC(II)743 / G(3)848 / CP465 / W&R649 / Cha284 / SP175 / URW054 / Lau475 Here in this place new light is streaming / Gather us in (Haugen). Excellent words, very well known. “Nourish us well and teach us to fashion lives that are holy and hearts that are true”. Lyrics and lead sheet. TiS 178 / G(II)335 / GC478 / GC(II)487 / G(3)565 Praise the God who changes places I like the joy of the tune written by William Rowan (BOE) for this song. Lyrics and sign language here (scroll to the bottom for the lyrics). Sample here, to a different tune. TiS 465 / AHB 399 / ATA 115 / NCH279 / UMH119 / A&M271 / Iona (SBL) / CH116 / GA381 / Lau313 Our God in heaven / Father in heaven / Loving Creator grant to your children (Maquiso / Niles) I really like this hymn, especially the Philippino folk melody to which it's set. Newer versions of the hymn from the Christian Conference of Asia have altered the lyrics to "Our God in heaven / Creator God" in the first verse. Other versions, such as CH4 have "Loving Creator / Parent and God". Seed sown which grows up together with the weeds. Separate them at the harvest time. 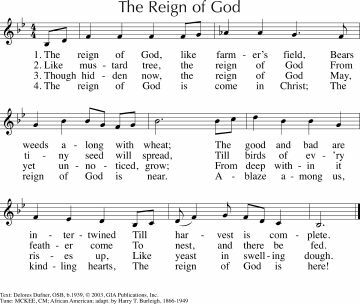 NCH608 Christ will come again (Wren) One of few hymns that talks about sifting the weeds from the wheat. The tune is new, and fits the unusual metre of these words. It should be picked up quite quickly by a singing congregation, but would benefit from a quick lesson before the start of the service. “Christ will come again, God’s justice to complete, to reap the fields of time and sift the weeds from wheat. Then let us passionately care for peace and justice here on earth, and evil’s rage restrain with love, till Christ shall come again”. *MV174 Soil of God (Holy Ground) The tune is quite siple and the words are good “Soil of God, you and I, stand ready to bear seeds of faith nourished by God’s tender care”. It's probably more appropriate for last week, but would also fit this week. *GtG171 A sower came from ancient hills (Steumpfle) Excellent words to a lovely tune that is simple to sing. Sound sample. ATAR593 Come to me all you who are weary (Lang) A soothly and slightly schmaltzy chorus. Easy to sing and fun accompaniment to play. What will you be singing? I'd love to hear your idea - please add them in a comment below.